Kit for a straight run of fencing, including posts and fittings. Two straight runs connected by a corner post. Three straight runs connected by two corner posts. Four sided enclosure with lockable gate for access. 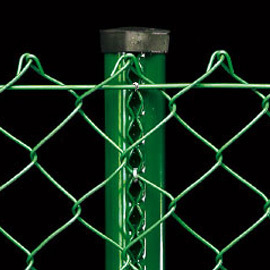 Our easy to fit chain link kits are the ideal option for small to medium sized fencing requirements. The kits include everything you will need to install your chain link fencing (except for Postcrete to concrete in your posts), and we supply detailed installation instructions with your order. We offer a kit for straight runs of fencing, L-shaped fencing, three sided fencing, and four sided enclosures. The four sided enclosure kit is supplied with a personnel gate for access.